United Nations Ombudsman the Honorable Shireen L. Dodson at UN Reception on Tuesday, March 26th. GEORGETTE BENNETT, Founder, Multifaith Alliance for Syrian Refugees, would like to update interested members that in little more than two years, the Multifaith Alliance for Refugees has delivered more than $125 million in humanitarian relief. Of particular interest to the Forum, Georgette believes, is the MFA’s Women’s Relief Program to address numerous problems facing women in Syria, including lack of access to healthcare through the targeting of medical facilities and professionals; sexual/gender-based assaults; unsafe living conditions and underage arranged marriages. MFA is dramatically expanding its shipment of women-specific products. She encourages members to share this important information with their friends, colleagues, foundations and media contacts. AMY BUTTE, Corporate Director & Advisor, has joined the Board of Directors of Tuscan Holdings Corp. (NASDAQ: THCBU). The Company went public on March 5, 2019. Tuscan Holdings Corp. is a blank check company organized for the purpose of effecting a merger, capital stock exchange, asset acquisition, or other similar business combination with one or more businesses or entities, with an initial focus on target businesses in the cannabis industry. ANNETTE GREEN, President Emeritus, The Fragrance Foundation, is thrilled to announce that her book, “Spritzing To Success With the Woman Who Brought An Industry To Its Senses” will receive the 2019 Perfumed Plume Awards Fragrance Book of the Year at an awards ceremony in April at The Society of Illustrators in NYC. NADINE B. HACK, CEO, beCause Global Consulting, gave the keynote address on International Women’s Day, March 8, 2019, hosted by Gerald Mathieu, Head of Barclays Private Bank Geneva. Barclays’ senior teams from Geneva, Monaco and Dubai were in attendance. Nadine was also honored at the 2019 Enterprising Women of the Year, 17th Annual Awards ceremony in Fort, Lauderdale FL on March 24-26. LIZ HAMBURG, President & CEO, Upstart Ventures LLP, is excited to share the launch of the website for her newest business – Candoo Tech – tech support and training for older people. Liz is offering Forum colleagues a chance to use the Candoo services for a free trial. Use promo code: Free Visit, HERE. RUTH ANN HARNISCH, President, Harnisch Family Foundation, was featured in the, “Love your age” column in Woman’s Day magazine, speaking about her work with Funny Girls, the program that centers around exposing girls ages 8-13 to improv comedy to help them build self-confidence. To see the feature, click HERE. ANN KAPLAN, Chair, Circle Financial Group, in her role as Chair of the Columbia University: Women Creating Change Initiative, hosted a panel on March 13th entitled “Corporate Feminism and It’s Discontents,” exploring gender and racial disparities in the corporate sector and the backlash of certain policies and strategies. ANNE-CLAIRE LEGENDRE, Consul General of France in New York, BARBARA VAN ALLEN, President, Economic Club of New York and PHYLLIS YAFFE, Consul General in New York, Government of Canada, were co-hosts of the Women in Business – Return on Investment Summit, building on the work launched under Canada’s G7 Presidency. BARBARA MARCUS, President & Publisher, Random House Children’s Books, is excited to be named the 2019 Graham Windham Gala Honoree. The event will take place on Thursday, May 16th at the American Museum of Natural History and benefits their important child-welfare programs. For more information or to purchase ticket/sponsorships for the event, click HERE. LIZ NEUMARK, CEO, Great Performances, is excited to announce a partnership with the Empire State Development agency to move their offices from Manhattan to the South Bronx creating 181 new jobs in the process. The offices will also provide space for The Sylvia Center, a nonprofit that provides nutrition and cooking instruction in high-need communities. To read the full press release click HERE. MARISSA SHORENSTEIN, Regional President – Northeast, AT&T, was recently named Chair of the Board, Girls Who Code, which strives for gender parity in the fields of computer science and software engineering. ELLEN SILLS-LEVY, Founder & Client Insights Director, ESL Insights, LLC, was thrilled and honored to be the Keynote Speaker at the Spears School of Business/Oklahoma State University 28th Annual Women’s Business Leadership Conference. Oklahoma IWF founded the conference with the Spears School of Business and is a major supporter. ALICIA SYRETT, Founder & CEO, Pantegrion Capital, served as a Judge at the Wharton Club of NJ’s Annual Entrepreneur Showcase and Pitch Event. On International Women’s Day, she spoke in the morning as a Panelist for WOW (Women at Oliver Wyman) representing WomenCorporateDirectors (alongside fellow Women’s Forum member DAVIA TEMIN) and at a UBS event in the afternoon entitled “Angels Unplugged.” She presented at the Republic Academy to entrepreneurs on “Securing Mentors and Building an Advisory Board.” She was also featured in Diversity in Action magazine in their “Innovators’ Insights” section, and her Point 25 Initiative was also featured in the same issue. KAY UNGER, President, Kay Unger Design, is excited to announce the 71st Annual Parsons Benefit Gala will be honoring the performer, Pharrell Williams, Founder and CEO, The RealReal, Julie Wainwright and Founder & CEO, Stitch Fix, Katrina Lake on Monday, May 20th beginning at 6pm. To read about ticket & sponsorship opportunities for the event, click HERE. Please submit newsletter content before April 20th to be included in the next edition. Submissions and corresponding media/links can be submitted below or in your “My Participation” section of your member portal HERE. Please limit submissions to approx. 150 words. Include any hyperlinks you would like us to use for the post as well. Submissions made after the 20th of the month may be included in the FOLLOWING edition of the newsletter. SARAH BEATTY BULLER, President and Founder, MontgomeryBUILDS, Green Depot & Greenmaker Industries, was featured in the Boston Globe for her work in the historic restoration of Montgomery, Alabama. BARBARA COOPERMAN, Kroll, Chief Marketing Officer, was appointed to the board of directors of Edith Wharton Restoration, Inc.
GLORIA FELDT, Founder & President, Take The Lead, Leadership Parity Movement, is pleased to share that Take The Lead’s three-month career acceleration program 50 Women Can Change the World in Journalism program kicked off February 6-8 at the Ford Foundation, which is the primary funder of this program. Many top female journalists and emerging leaders are among its participants. This is the organization’s first program specifically for journalists and it comes at a time when the profession is roiled in chaos and change, with layoffs in both traditional and digital newsrooms. Attendees will go through an intensive three-month program that combines virtual and immersive in-person sessions, as well as personalized, one-on-one coaching. Each participant will develop and be held accountable for her own Strategic Leadership Action Plan. In addition, the cohort will create plans for how they can support each other while leading positive change within their industry. Results have been phenomenal in previous sector programs. Take The Lead delivers this signature program with customization for various sectors and industries. The next sector to launch in NYC will be 50 Women Can Change the World in Finance. Forum members are encouraged to visit this page to learn more about it and to nominate women you believe would benefit from the program (or apply yourself). Corporate sponsorship opportunities are also available. Feel free to contact her for more information. GINA GIBNEY, Founder, CEO and Artistic Director, Gibney Dance, was profiled in Crain’s Business New York. To read the article click HERE. AMY KOPELAN, President and Founder, Bedlam Productions, has been asked to head the marketing and branding team for Animal Lighthouse Rescue, a vibrant sister organization to Los Animales El Faro in Puerto Rico where teams of doctors and volunteers rescue stray and lost dogs from the streets and beaches, give them good medical care, and bring them to NYC to find “fur-ever” families. Amy will be heading to Puerto Rico four times this year to work at the clinic and shelter and right now she has 3 rescue dogs at home. If you want to foster an adorable puppy or even an adult dog, please contact Amy. WENDY MENDENHALL, former Global Executive in Charge and Managing Director, BritishAmerican Business Independent Consultant, was recognized by the UK Honour System and made an Honorary Member of the Most Excellent Order of the British Empire for her services to transatlantic business relations. BETTYE MUSHAM, Chairman & CEO, GEAR, is excited to share news about her latest book titled, “The Thing I Miss Most is My Mind: An Insider’s Guide to Achieving Positive Results When Confronting Alzheimer’s.” One out of nine people in the US over the age of 65 has Alzheimer’s. This means most adults will know someone with this disease and this book attempts to address many of the issues that they will confront in relation to the disease. CAROL ROBLES-ROMÁN, announced that she will be stepping down from her position as Co-President & CEO of the ERA/Coalition Fund and take a new role as General Counsel and Dean of Faculty at Hunter College (the President of which is the Forum’s own JENNIFER RAAB). Carol will remain the Secretary and a part of the executive board of the ERA Coalition. To read more about her new position, click HERE. Carol was also interviewed in an NYT article about the Equal Rights Amendment and the resurgence of interest surrounding it. MARCY SYMS, Former Chairman & CEO, SYMS Corporation, was featured in Director’s & Boards, February Board Book Survival Guide. February 13, 2019 -Forum Members: BARBARA COOPERMAN, EUNICE SALTON & KAY UNGER attended the Parsons’ annual Marvin Traub Lecture Series featuring Gucci President & CEO, Marco Bizzarri in conversation with Tim Blanks, Editor-at-Large of The Business of Fashion, courtesy of Kay herself! Please submit newsletter content before March 20th to be included in the next edition. Submissions and corresponding media/links can be submitted below or in your “My Participation” section of your member portal HERE. President Linda Willett, introducing Forum member Paige Evans who interviewed special guest Phylicia Rashad at the 2019 Annual Meeting hosted by Forum member Kristina Johnson, SUNY Chancellor. GEORGETTE BENNETT, Founder, Multifaith Alliance for Syrian Refugees, is honored to announce that she was recognized for her work impacting the lives of vulnerable people and strengthening the connection between Israel and the global Jewish population. The Global Impact Awards were presented at a gala event at the Tel Aviv Museum on January 16th in the presence of H.E. the President of Israel, Mr. Reuven Rivlin. BETH BROOKE-MARCINIAK, Global Vice Chair, Public Policy, EY, was appointed to the Board of Directors for the United States Olympic Committee. To read more about this appointment, click HERE. ROHINI DEY, Owner/Founder, Vermilion Restaurants (NYC/Chicago), gave a TED Talk about her work in the culinary industry and confronting the ‘gastro-ceiling.’ To watch the video, click HERE. PAULA DIPERNA, Consultant; Special Advisor, Carbon Disclosure Project; former President, Chicago Climate Exchange (CCX) International; Joyce Foundation, has been invited to testify on economic and capital risks of climate change before the House of Representatives Sub-Committee on Natural Resources on February 5th. It will be the first hearing of the new Congress on these topics. Earlier this year, Paula was invited to the Vatican to speak about similar topics and met Pope Francis (wearing a jacket by Forum colleague NINA MCLEMORE no less!). Paula will again be at the Vatican in March speaking on the social disruptions being caused by climate change worldwide as well as in Hong Kong and other locations in Asia. Paula DiPerna meeting Pope Francis in the Vatican. TIFFANY DUFU, Founder & CEO, The Cru, was featured in a segment on MSNBC in response to a report that men feel “scared” about mentoring women in the workplace and what can be done about it in the wake of the #MeToo movement. To watch the video, click HERE. JANICE ELLIG, CEO & Founder, The Ellig Group, has created a new podcast entitled Leadership Reimagined where she will sit down with real leaders in this series of game-changing conversations, bespoke to fellow champions of change. To learn more about the podcast or download the latest episode, click HERE. AMY FREITAG, Executive Director, J.M. Kaplan Fund, announced the opening of the application process for the 2019 J.M.K. Innovation Prize, which will distribute a total of 1.75 million to ten early-stage social innovators working in the environment, heritage conservation, or social justice fields. To read more about the application process, download a one-pager HERE. ANNETTE GREEN, President Emeritus, The Fragrance Foundation, is delighted to share the news that Spritzing to Success, her recently published book, has been named Best Fragrance Book by fragrance blog ÇaFleureBon who has been awarding the Best of Scent awards since 2010. It was also chosen as one of the National Association of Book Entrepreneurs (NABE) Pinnacle Book Achievement Award Winners for Fall 2018. LOU HAMMOND, Chairman/Founder, Lou Hammond Group, is excited to share that Lou Hammond Group has the following new clients: Burgess Yachts, Fischer Travel Enterprises, American Quilter’s Society, Mexico Beach, Fla. Two Roads Development and The Children’s Museum of the Lowcountry. AMY DORN KOPELAN, President and Founder, Bedlam Productions Inc., is proud to be traveling with Animal Lighthouse to help with dog rescue in Puerto Rico. The El Faro shelter was destroyed in the last storm so this is a chance to rebuild it onsite and save more animals. To see more or to foster, click HERE. SALLIE KRAWCHECK, CEO & Co-Founder, Ellevest, was interviewed on the Daily Show with Trevor Noah about how Ellevest is challenging the gender gap in investing. To see the extended interview clip, click HERE. GABRIELLE KURLANDER, President and CEO, All Stars Project, is directing the play Billie, Malcom & Yusuf at the Castillo Theatre. The play opens at a funeral. Among the guests mourning the passage of the “dear departed,” are the great revolutionary Malcolm X, the legendary blues singer Billie Holiday, and a black teenager Yusuf Hawkins, who was brutally murdered by a white mob in 1989. As the funeral procession makes its way through the Gates of Heaven, we learn the identity of the “departed,” the conflicts between Billie, Malcolm and Yusuf, and their struggle to live, love and laugh without gods or icons. With songs, humor, powerful reminiscences, historical footage and more than a few surprises, these characters take the audience on a spellbinding journey. The show opens February 15th – click here for tickets! LINDA LANGTON, President, Langtons International Agency, will be launching a new division of her business focused on memoirs. This new memoir division matches women of achievement who want to write their unique memoir, whether as a business book to heighten their entrepreneurial success story, an inspirational memoir as a legacy for family or the world at large, or for an A-List personality to share with the world. LISA MONACO, Distinguished Senior Fellow at the Center on Law and Security, NYU School of Law, spoke with host Michael Morell for an episode of the Intelligence Matters podcast. She reviewed her career trajectory from Federal prosecutor to Hill staffer to running the National Security Division at the Department of Justice to a series of high-profile roles at the White House. Lisa also evaluated the existing threat from foreign-directed terror attacks, the importance of continuity in counterterrorism policy, and the evolution of cyber threats facing the United States. To hear the episode in full, click HERE. JOANNA MASSEY, is pleased to share that she has just launched her own bi-coastal communications firm, JDMA where she will serve as President & CEO. The announcement, posted on deadline.com, can be read HERE. STEPHANIE MEHTA, Editor in Chief, Fast Company, moderated a panel as part of the DAVOS Dialogues series at this year’s conference focusing on the human side of digital transformations. LAURA CLAYTON MCDONNELL, is excited to share that she has accepted a new position as Vice President, Enterprise Sales – Eastern Region at ServiceNow. SHARON ROWLANDS, was recently named the new CEO of Web.com Group Inc. To read more about this selection, click HERE. WESTINA SHATEEN, Managing Director (Ret), Merrill Lynch, is pleased to let Forum members know that her book, Dancing from the Inside Out: Grace-Filled Reflections on Growing Older will be released in October 2019 by Church Publishing, the Episcopal Publishing house. The book will be a collection of essays about ordinary events that invites the reader to reflect on how God can be found in the season of aging. ALICIA SYRETT, Founder & CEO, Pantegrion Capital, was selected to attend the “CEO Innovation Immersion Experience,” by Grant Thornton at the 2019 Consumer Electronics Show (CES). The event brought together thought leaders to engage in peer exchanges, exclusive behind-the-scenes tours, and board strategy and innovation sessions. Author Erica Jong in conversation with Forum member Ann Pinkerton and hosted in the home of Forum colleague, Janice Ellig on January 14th. Doctors Crow and Salmon presented their research concerning women and autoimmune diseases hosted at the office of Fiduciary Trust thanks to Forum member Gail Cohen on January 24th. Please submit newsletter content before February 20th to be included in the next edition. Submissions and corresponding media/links can be submitted below or in your “My Participation” section of your member portal HERE. The home of Loreen Arbus, our host for the Annual Women's Forum Holiday Party. SYLVIA ACEVEDO, CEO, Girl Scouts of the USA, was named as one of Forbes, Top 50 Women in America in Tech. To read her profile and see the other women named, click HERE. BETH BROOKE-MARCINIAK, Global Vice Chair, Public Policy, EY, was named one of 2018’s OUTstanding Role Model’s for her work towards LGBT rights and inclusion initiatives both within her organization and in her community. To read about her selection, click HERE. MAURA CARLEY, President & CEO, Healthcare Navigation LLC, was invited to speak at the November meeting of the Estate Planning Council of Fairfield County where she presented “Don’t Let Poor Healthcare Planning Ruin the Estate Plan.” Later that day Maura was the featured webinar speaker on “Healthcare Coverage in Splitsville” hosted by the Brooklyn-based group UNtied. In December Maura was invited to present to Bessemer Trust Client Account and Wealth Managers nationwide on how Healthcare Navigation helps clients with the difficulties faced in the current healthcare environment and also spoke on “Healthcare Coverage and Divorce” for the Association of Divorce Financial Planners in Manhattan. GLORIA FELDT, Founder & President, Take The Lead Leadership Parity Movement, would like to thank so many Forum members for joining her at a fundraising performance for Take the Lead, of Gloria: A Life. The event was a huge success! Forum members from left to right at the event: SYLVIA ACEVEDO, BILHA FISH, SUSIE GREENWOOD, GLORIA FELDT, ANGELA DIAZ, CAROLYN CARTER and LORETTA MCCARTHY. KAY KOPLOVITZ, Chairman & CEO, Koplovitz & Co., was honored by the Yale School of Management, Chief Executive Leadership Institute’s CEO Summit. She was presented with the Maverick in Leadership Award by David J. Stern, chairman emeritus, NBA. To read more about this prestigious award click HERE. ALICE TEPPER MARLIN, Founder & President Emerita, Social Accountability International, spoke on Dec. 5 at a professional education panel for lawyers on business & human rights in fashion. The panel was organized by Dunnington, Bartholow & Miller. SHAWN OUTLER, Macy’s, was named Macy’s Executive Vice President, Chief Diversity Officer. To read more about this important new role, click HERE. ALICIA SYRETT, Founder & CEO, Pantegrion Capital LLC, appeared on MSNBC’s Your Business in a “Ask the Expert segment. She emceed the NY Tech Meetup Women’s Demo Night and served as an Evaluator for Columbia Business School’s Greenhouse program. She also served as a Judge at Fordham Foundry’s VentureUP! Pitch Challenge and at the German Accelerator’s Pitch night at the German Consulate General at the United Nations. ELLEN PIKITCH, Professor and Executive Director, Institute for Ocean Conservation Science, has been named the Ocean Sanctuary Alliance’s, Endowed Professorship in Ocean Conservation Science in the Schol of Marine and Atmospheric Science. This position and funding will allow her to lead the ocean conservation movement across the globe. To read more about the selection, click HERE. ALAIR TOWNSEND, Columnist, Crain’s New York Business, was inducted into the 2018 Crain’s New York Hall of Fame. To read her profiling interview, click HERE. ALICE YOUNG, Corporate Director, was interviewed as a member of the first class of women after Yale became co-educational. The series is called “1968: Fifty Years Later.” To listen to the episode which was included on NPR/WNYC’s; All Things Considered, click HERE. SIGAL ZARMI, is excited to share that she has begun a new role within Morgan Stanley as their Head of Transformation. LINDA ADDISON, Norton Rose Fulbright US LLP, Immediate Past Managing Partner, was appointed to the board of KPMG. To read more about the appointment, click HERE. JOYCE BROWN, President, Fashion Institute of Technology, was interviewed for Crain’s New York Business, Asked and Answered feature. GLORIA FELDT, Co-Founder & President, Take the Lead, invites members to join Take the Lead for a benefit matinee performance of “Gloria, a Life” December 15. Gloria S. will lead the audience discussion. A VIP reception featuring Forum member and Tony-winning producer DARYL ROTH, dinner afterward, and other perks are available. Details are here for individual tickets, and here for corporate sponsorships. Even if you can’t attend, or if you attended the Forum event, you can still support leadership gender parity by enabling a young woman to attend. Individual tickets are $250. As a special courtesy to Forum members who purchase $1000 VIP tickets, we’ll include an additional ticket so you can bring another woman with you—perhaps a daughter, a Forum Fellow or mentee, as well as an invitation to the VIP reception, and a gift bag with Gloria merch. Contact Forum and event host committee members Gloria Feldt, Susie Greenwood or Loretta McCarthy for more information. NADINE B. HACK, CEO, beCause Global Consulting, was featured on The Voice of BOLD Business Radio Nov 6 talking about corporate social responsibility; stakeholder engagement; diversity and inclusion; self-awareness for leadership development. Tune in to listen. She is a regular contributor to the Library of Professional Coaching and you can read her Sept 26 post on communications here. Nadine was also a participant/contributor at the Salzburg Global Seminar program,New Horizons in Social Investment: Global Exchange for Action and Impact Oct 27-30. 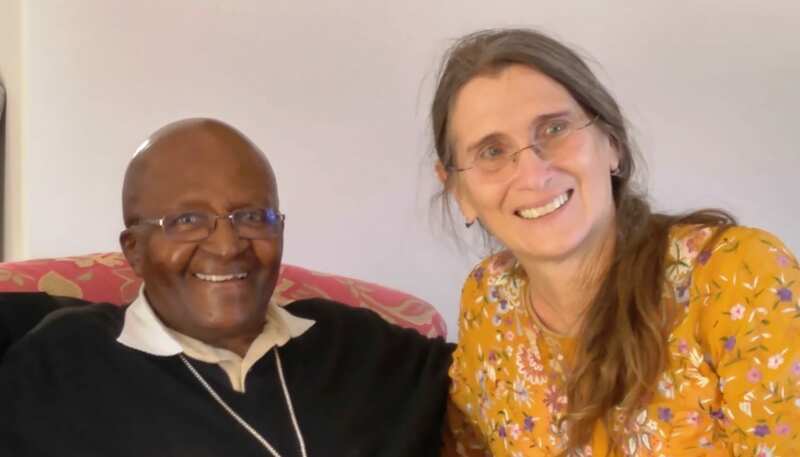 NADINE B. HACK, pictured above with Archbishop Emeritus Desmond Tutu who’s written the foreword to a book she’s working on, The Urgency of Connectedness, to be published in 2019. SALLY HELGESON, President, Helgesen Associates, was a speaker at the 10th Peter Drucker Forum in Vienna Austria on November 29th & 30th. The event centers on leadership and effective management. LORI TAUBER MARCUS, Chair of the Direct-to-Consumer/Patient Initiative at Harvard Business School’s Kraft Precision Medicine Accelerator, has been named to the board of directors of Golub Corporation, a large privately held supermarket operator in the Northeast (d.b.a Price Chopper and Market 32). CARLA SINGER, President, Carla Singer Productions, is an Executive Producer on the documentary film, Jewish Partisans of World War II. The film features brave women and men resistance fighters telling their stories of survival while fighting the Nazis. EUGENIA ULASEWICZ, Bunzl plc, Hudson Group, Signet Jewelers and Vince, Non-Executive Director, was honored to serve as Director in Residence for the November 2018 Northwestern University, Kellogg School of Management Annual Women’s Director Development Program which helps senior executive women seeking directorships to develop a deep understanding of board responsibilities and how to best present themselves as viable board candidates. LINDA WILLETT, Senior Vice President, General Counsel and Corporate Secretary, Horizon Blue Cross Blue Shield of New Jersey, was honored by The Newark Public Library at its annual “Booked for the Evening” Gala on November 29th. Each year, the Newark Public Library recognizes leaders who have exhibited a “tradition of innovation and service” in their work. Linda talked about the profound impact that libraries and librarians have had on her career, including the fact that she got a degree in Library and Information Science simply because she loved libraries so much! ALEXANDRA WILKIS WILSON, Senior Vice President, Consumer Strategy and Innovation, Allergen and Co-Founder of Gilt, GLAMSQUAD and Fitz, was profiled in an interview on Forbes.com. She was also interviewed for a series of articles called Second Life, on MyDomaine.com, about her own experience and advice for transitioning careers. Nov. 5 - Rebecca Blumenstein of The New York Times moderated a panel on getting from C-Suite to boardroom. Nov. 8 - Members dined in one another's homes in another popular edition of the small dinners programs. Class of 2018 Education Fund Fellows at the Random House Fall Fanfare. LEIGHANNE BAKER, Chief HR Officer, Corporate Senior Vice President, Cargill, is excited to share that she has been elected to the ABM Board of Directors, effective immediately. To read more about the appointment, read the press release HERE. BEVERLY BEAUDOIN, Principal, Beverly Beaudoin & Associates; SUSAN FALK, Retired Fashion Industry CEO and Non-Executive Board Director; GRACE RICHARDSON, Former Vice President, Colgate-Palmolive Company, have been appointed to the Advisory Board of Karen Roberts New York. Karen Roberts designs and manufactures classic American style sheath dresses for day, evening, after 5 and special occasion. The dresses are beautifully crafted, sewn in NYC and produced available in a multitude of fabrics, colors, patterns, and textures. JANICE ELLIG, CEO, The Ellig Group LLC, will be speaking at the Yale University Women on Boards Program, a week-long course offered to women interested in joining their first corporate board. She will also be accepting the award for Distinguished Service to the YMCA at this year’s Harold C. Smith Annual Dinner on November 14th. LUDY GREEN, President and Founder, Second Chance Employment Services, was recently appointed by the United States Agency for International Development (USAID) as the Agency Lead on Counter-Trafficking. In this role she will address trafficking in persons internationally through foreign assistance initiatives, programs and policies, in the USG interagency, and intra-Agency policy and programmatic fora. CHERYL HELLER, President, CommonWise, the Measured Lab, SVA, is excited to announce the publication of her newest book, The Intergalactic Design Guide: Harnessing the Creative Potential of Social Design. She was also interviewed on Wharton Radio and published an article in the Harvard Business Review. RIKKI KLIEMAN, Attorney and CBS News Legal Analyst, CBS, was honored to conduct the interview of Dr. Angela Onwuachi-WIllig, the new Dean of Boston University School of Law at a reception at Proskauer Rose in New York City on October 23. Rikki also spoke at Northwestern University’s Council of 100 for their 25th Anniversary about what has changed for women during this quarter century; she spoke at the Founding Members meeting on women who wanted to have it all in 1993. In September, Rikki was chosen to cover the Kavanaugh hearing in Washington DC with the CBS News Anchors where Dr. Ford and Brett Kavanaugh testified. CAROL ROBLES-ROMÁN, Co-President and CEO, ERA Coalition and the Fund for Women’s Equality, was profiled in an article for the Guardian earlier this month. To read the complete text of the story, click HERE. CASEY SANTOS, Chief Information Officer, General Atlantic, will be honored at the YMCA of NYC’s 4th Annual Hispanic Achiever’s reception on Tuesday, November 6th at Carnegie Hall. Her fellow honorees include: Rick Gomez, EVP & CMO, Target and Félix Matos Rodríguez, President, Queens College. To learn more about the event, click HERE. LISA SUN, CEO, Project Gravitas, was profiled in an article for Forbes, discussing the groundbreaking work she and her company are doing in the fashion industry, especially in the sphere of body diversity/positivity. To read the entire article, click HERE. LISA SUN, CEO, Project Gravitas and JOI GORDON, CEO, Dress for Success Worldwide, are pleased to partner to kick off the holiday season with a Giving Tuesday campaign. The campaign, called #DFSPowerPiece, celebrates the moment when a woman puts on that special item that makes her feel confident and powerful. Project Gravitas is one of five signature partners with featured pieces in a curated “Success Collection” to be sold via a dedicated microsite. A percentage of sales from the Gravitas Josephine blazer and other partner pieces will benefit Dress for Success and support more women in finding their power. #DFSPowerPiece kicks off on social media in November with a call to action for individuals to donate to Dress for Success and to post a picture of their power piece, and cumulates on November 27, 2018, when #DFSPowerPiece shopping goes live. Learn more and prepare to share your power on Instagram, Facebook or Twitter @dressforsuccess and #DFSPowerPiece. JUDITH SPITZ, Founding Program Director: Women in Technology and Entrepreneurship in New York, Cornell Tech, is excited to announce a unique program that tackles the issue of making sure that women are able to close the gap in landing STEM paid internships, so vital to their professional success after graduation. The program works with companies large and small to make sure that female STEM students secure paid 3-week “Winterships” during January recess. To learn more, click HERE. JANICE ELLIG, CEO, The Ellig Group, was a featured speaker for Jeffrey Sonnefeld’s Yale School of Business course, “Corporate Governance: New Challenges & Old Duties.” She will also speak at an upcoming luncheon for the first day of their Women on Boards Event. GLORIA FELDT, Founder & President, Take the Lead Leadership Parity Movement, is excited to share that Take The Lead’s signature 50 Women Can Change the World program will be available in NY for 5o emerging high potential leaders in the financial industry starting November 2. She would encourage Forum members to nominate women they think would benefit from this program that gives women incredible career breakthroughs. The program will address other industries at upcoming dates, a list of which can be found HERE. Gloria would also like to invite any member who cannot attend the Forum theater event for “Gloria: a Life,” to join Take The Lead on December 15 for the matinee performance, also one where Gloria Steinem will lead the discussion, plus additional perks! Please let her or Susie Greenwood know if you are interested and they will be in touch. ANNETTE GREEN, President Emeritus, The Fragrance Foundation, recently published her business memoir, “Spritzing to Success with the Woman Who Brought An Industry to its Senses.” Women’s Wear Daily wrote, “Spritzing to Success” shows how the Industry veteran navigated through social and cultural changes in the early 60s to help develop fragrance into a multimillion-dollar industry. ANN SPUNGEN, VA Senior Research Scientist and Associate Director, Spinal Cord Injuries, is pleased to share that four of her exoskeleton users were participants in the New Balance 5th Ave. Mile organized by the New York Road Runners. Peter Schreiner, son of Forum member MARY KATE WOLD was one of them and even won the Bionic athlete’s race! Sept. 9, 2018 - Bionic Runners at the starting line of the 5th Ave. Mile Race. ALICIA SYRETT, Founder & CEO – Pantegrion Capital, was interviewed by the National Association of Corporate Directors (NACD)‘s Chief Programming Officer in a Fireside Chat on “Shifting Stakeholder Expectations and the Role of the Board” at the NACD’s MasterClass conference in Newport Beach, CA. Her TEDx talk on “Why Investors Say No” was released and can be seen here. She also spoke on a Venture Capital Panel for the Amazon Web Services University Accelerator. LINDA ZANGO-HALEY, Principal, The Haley Group LLC, would like to invite members to attend a breakfast discussion panel on protecting voter rights, Tuesday, October 9th, 8-10am. The public policy series, Marxe Issues, is part of the Baruch College School of Public and International Affairs. Those interested in learning more or attending, click HERE.